My alma mater hosts Louisiana Tech Saturday at 9 am Pacific time on Fox Sports One, so your morning is now planned. Unless, of course, you have.... anything else to do. Now if you're a Notre Dame fan, this matchup is probably the closest thing you'll get to an Irish win on Saturday (they are playing Michigan State) because the head coaches are both Notre Dame alums and former Notre Dame coaches. Charlie Weis, KU's head man, you know about. What you may not realize is that Louisiana Tech's new head coach is one Skip Holtz, Lou's kid. Skip has been a college football coach in some form or another for 25 years now, and got a lot of doors opened for him to begin his career. Gee, I wonder why? According to his wiki page, his dad actually called Bobby Bowden at Florida State and asked if he would hire Skip as a 22 year old new college graduate with no coaching experience. Bobby said “if he can be here in two days.” Weird, I've never been hired over the phone that quickly. I wonder if his dad had anything to do with that. Now, Skip did meet his future wife at Florida State, she was working in Bowden's office as an assistant. So that's kinda cool. Anyway, unlike Bowden's kids, who keep seem to getting prominent D-1 head coaching jobs and mucking them up big time (Example A: Terry Bowden and Auburn), Skip seems to be stuck in the middling ground of college football: UConn, (before it moved to D-1) East Carolina, South Florida (where he was fired after last season), and now, in his first year at Louisiana Tech. Skip is almost 50. By the time Lou was 50, he had been head coach at North Carolina State, the abysmal failure that was (and still is, because they don't his help) the New York Jets, Arkansas, Minnesota, and was in his second year of his 10-year run at Notre Dame. What this tells me is that even though Skip has the name to get big time, at some point it's about what you can do as a head coach.... and he hasn't done it. Say what you will about Kansas football, at least it's still in an auto-bid BCS conference (for now) and has an Orange Bowl win within the last decade. Louisiana Tech went 9-3 last season (with Sonny Dykes, Cal's new head coach, at the helm) and didn't get invited to a bowl. If a BCS conference team, even one as bad as KU, finishes 6-6, they're going somewhere for the postseason. That's the difference. Anyway, on to the game. 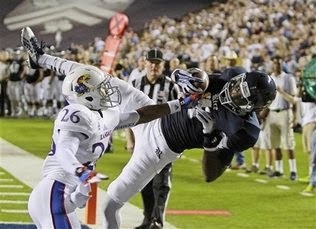 Last week KU lost at Rice, as suspected, because, well, they can't stop Rice in the 4th quarter. Last year the Owls scored ten unanswered to win, this year the Owls scored ten unanswered to win, as KU led 14-13 in the third and lost 23-14. Remember how last week KU was second in the nation to Alabama in passing defense? This week, after giving up 178 passing yards to Rice (still very good) they're now “among the leaders.” I'm not going to bother to look up stats. It's my alma mater, but let's be serious here, it's KU football, it's kinda like watching the Red Soxbefore they won the World Series. Pay attention, mostly, but you know they're terrible and even the good things are fluky. It does appear that Louisiana Tech has a similar issue with scoring as KU does. Last week they forced four turnovers against Tulane in the C-USA opener, managed just three points, and lost 24-15. It does appear that the Bulldogs will be able to get to KU quarterback Jake Heaps early and often, as LA Tech is tied for third in the nation with 4 sacks per game, while KU is 94th in sacks allowed per game at 2.5. Remember, there are 125 D-1 college teams. If I'm Charlie Weis and the KU offensive schemers, I take this into account and come up with a lot of quick passes. Get the ball into the flat quickly, out routes, etc. Play action and plays that take a while to get going will not be good against this team. Heaps cannot hang onto the ball. A seven step drop would be a bad idea. It would not surprise me if this game had a similar scoring output to the first game Louisiana Tech and Kansas ever played, in 1987. KU led 5-3 at the half and lost 16-11. Maybe even the Notre Dame fans should avoid this one. But I'll have a go. I really don't have much else to do.